Tasty little pastries stuffed with spinach and pine nuts that would make for a lovely Middle Eastern style mezze meal. Add ricotta if you like, and if you want to, substitute the home-made pastry for a few sheets of flaky filo. Mix together 200g plain flour, 200g water, 1 tbsp. olive oil and baking powder in a bowl until a smooth dough forms. Knead for five minutes until it is elastic and comes away from the work surface with ease. If it is too wet, add a little more flour. Leave the dough to rest for 20 minutes. 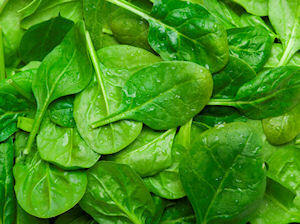 Meanwhile, blanch, drain and squeeze the spinach of excess water before roughly chopping. Finely dice the onions and mix in a bowl with the spinach, pine nuts, lemon juice, sumac spice and salt and pepper. Heat the oven to 180C. Roll out the dough until thin and cut into 8cm diameter circles. Put a tbsp. of the spinach filling onto each circle, then fold up and into a triangle. Seal the seams with water so that the pastries won't open whilst cooking and then bake in the oven for 10-15 minutes until golden. Some finely diced proscuitto ham would be a lovely addition to the spinach filling. Recipe makes 12.